Pin It Glitter everywhere! Who doesn't like glitter? Ok, rhetorical question haha! 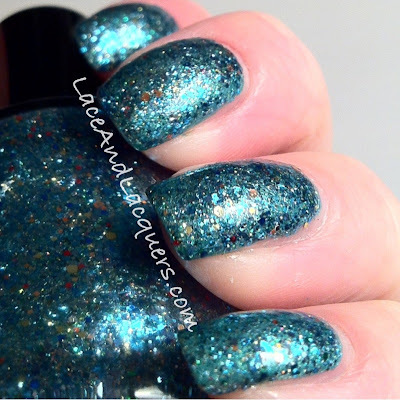 If you don't like glitter, I'm sorry :[ ...This post is packed with glitter if you love glitter! I saved my 2 favorite for last! If you missed the first part to this 2 part review, check it out here! 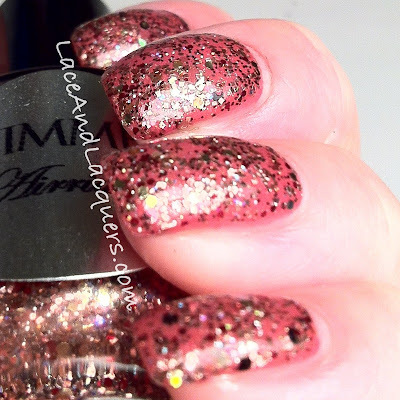 So for some more glitter, jump on over! I could even leave these in the bottle and stare at them all day! But that's no fun now is it? I did 2 coats over Revlon Really Rosy. First thing I notice about this polish? The super awesome random black hexes! Also in this crazy awesome mix of glitter is some rosy pink, gold, iridescent green, iridescent blue/purple, and red glitter. I think that's it! There's so much glitter, I stared at it long and hard I hope I didn't miss any colors! There's a mix of hex and squares of various hexes and squares, the black hex is the largest and there's also some micro glitter. There's a shimmer through out the clear-ish pink base also. I don't normally wear glitter layered over itself and no undies but, I can totally see myself wearing this one alone! 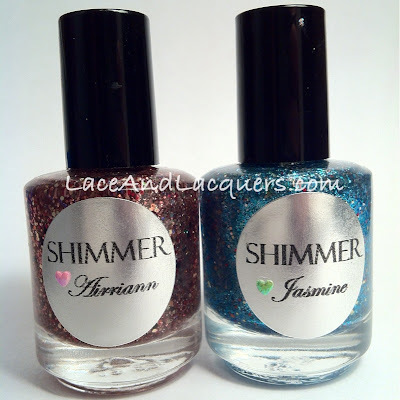 Just like Airriann there's a surprise glitter color, in the midst of this aqua glitter there's red mixed in! I did 2 coats over Zoya Zuza. 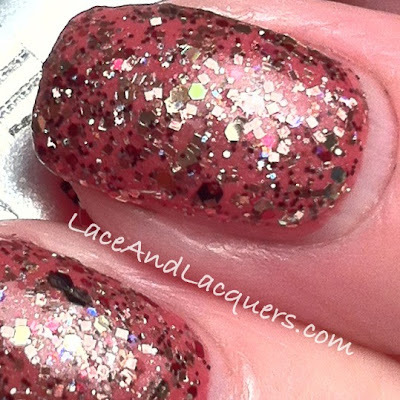 This polish is super glitzy and fun! 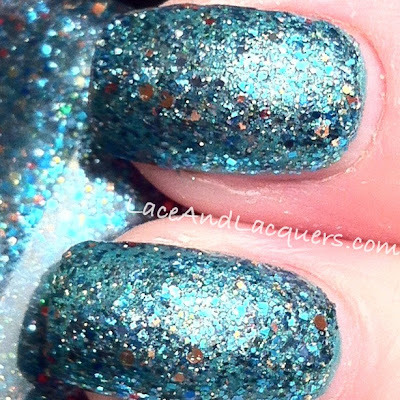 Kinda reminds of an aqua disco ball! LOL This polish is mostly turquoise with some blue, gold, red, silver and green glitter. Like Airriann, this also contains a mix of hexes and squares. Tish of Pretty Face, Happy Bank posted a picture on IG of Jasmine layered over red - It was AMAZING! I wish I did that! I can't find the picture for you though :[ Booo! 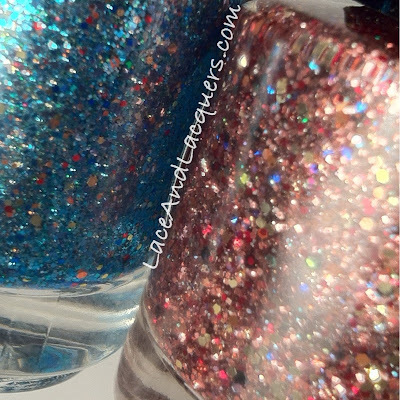 Both of these polishes were pretty smooth for as much glitter as they are packed with! Like last time, I was surprised with how great application was - no chunking and no need to dip and dab around the nail. Unlike the other 2 polishes I reviewed for Shimmer Polish, these 2 seem to lie a bit more flat and only require ONE coat of Seche Vite VS 2. 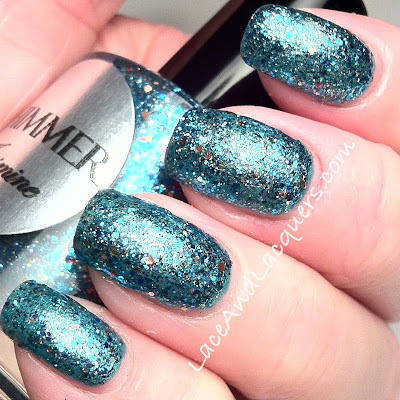 You can find Shimmer Polish on Etsy! Her polishes are a little on the steep side for an Indie polish, at $12/bottle, but I'd say it's worth every penny for these glitters. You can also visit her Facebook page, here. 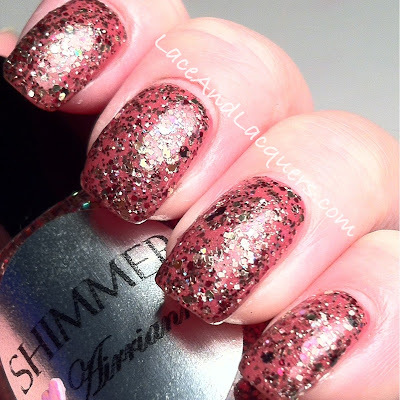 What do you think of these pretty little glitter bombs? 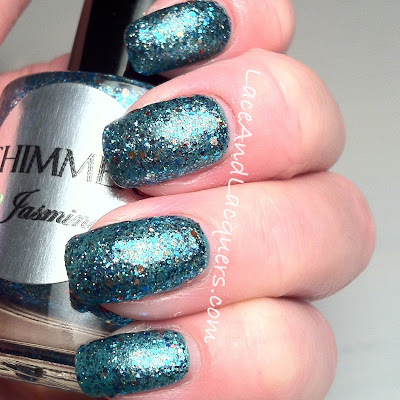 I love Jasmine it is amazing!!! Of the two, I really like Jasmine! It is beautiful!! I need Jasmine in my life. I like the dusty rose base you paired with Airriann!